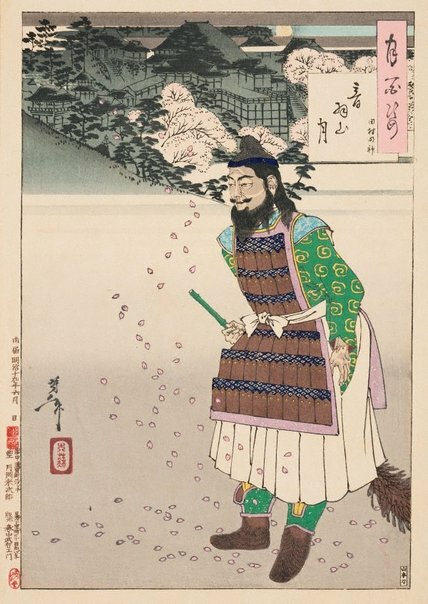 This print illustrates a scene in the nō play 'Tamura'. Three itinerant priests meet a man sweeping fallen cherry petals as they visit the Kiyomizu temple in Kyoto. The man reveals himself as the ghost of Sakanoe no Tamuramaro, who was a famous general of the later Nara period (710–94). Sakanoue waged campaigns against the Ebisu, the indigenous people of northern and eastern Japan, and was deified as the Shinto god Tamura Myōjin after his death in 811. It is said Tamura assisted the priest Enchin in the founding of Kiyomizu temple on Mount Otowa.